Scott Eyestone, responder liaison for Disaster Management, demonstrates a DMIS terrorism scenario depicting a chlorine gas release at the Navy Annex, which sits upwind from the Pentagon. Battelle Memorial Institute continues fielding calls about its Disaster Management Interoperability Service, a network backbone for connecting first responders that has quietly gained nationwide acceptance over the past year. Last month the system was put to the test during Determined Promise 04, an exercise conducted by U.S. Northern Command, after Homeland Security Department Secretary Tom Ridge called to request that DMIS be involved. Columbus, Ohio-based Battelle demonstrated DMIS for the press Aug. 31 as part of a briefing on its research into biodefense technologies. More than 735 organizations have adopted DMIS, and a handful of states, including Connecticut, Florida and Maryland, have chosen to roll out the system statewide. According to Battelle officials, DMIS has been used in nearly 50 actual disasters, including Hurricanes Isabel, Charley and Frances. Program manager Scott Eyestone said DMIS began roughly four years ago as the Marines' Consequence Management Interoperability Services suite. 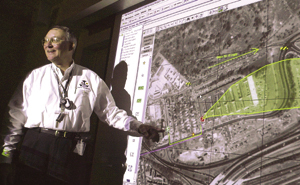 After the Sept. 11 terrorist attacks, the program was put on a fast track, and the Federal Emergency Management Agency took it over. DMIS is part of the administration's e-gov initiative for disaster management and a primary component of the Homeland Security Department's Homeland Security Information Network. It is free to state and local agencies and requires little more than a PC and an Internet connection to run. Users publish information about local disasters on a secure network where first responders can access the data and post feedback. They also have access to maps, weather data and basic collaboration tools such as instant messaging. "Each community of users defines the rules of who see what information," said Matt Wald, Battelle's head of IT solutions. DMIS is not a software product itself, although agencies can access it through a secure Web browser. It comprises a set of common services and open software interfaces that organizations can use to plug into the DMIS backbone. Wald said the toolset was designed to serve as a bridge to commercial incident response applications that could exchange information. As agencies become more sophisticated DMIS users or find the funds to purchase a robust incident response program, they can plug those applications into DMIS and exchange data nationwide, as long as the software adheres to DMIS and industry standards. In 2002, Battelle's DMIS group joined about 60 other organizations, including several software vendors, to form the Emergency Interoperability Consortium. In addition to government agencies such as the Defense Information Systems Agency, the EIC includes integrators Anteon International Corp., IBM Corp., Science Applications International Corp. and others. Last summer, EIC published its first open standard, the Common Alerting Protocol, which defines the way agencies can exchange alerts across the DMIS backbone. The protocol was ratified by the Organization for the Advancement of Structured Information Standards, an international body that handles Web services standards. Battelle's Eyestone showed how agencies using emergency management applications such as Blue Emergency Management from Durham, N.C.-based Blue292 Inc. and WebEOC from Augusta, Ga.-based Emergency Services Integrators Inc., could use the DMIS backbone to collaborate. Both systems are Web-based applications, but Eyestone said the long-term goal is for DMIS-compliant commercial applications to be client-server-based. "In a disaster, you can lose communications," Eyestone said. By adopting a client-server model, first responders can continue working in their incident response application and synchronize their data after network connectivity is restored, he said. "People say client-server is old technology," Eyestone said. "No, it's technology driven by functional requirements." With 16,000 employees, Battelle develops technology and manages laboratories for the government. The non-profit company had 2003 revenue of $1.3 billion and ranked No. 35 on Washington Technology's 2004 Top 100 list, which measures federal contracting revenue.